This time of year, bugs can be a real drag. Not only are they annoying—flying around foods and faces—but they can also cause allergic reactions and pass along serious illnesses. Your best defense against bug bites is an effective and long lasting insect repellent. In the past, the term "effective" usually meant a hearty dose of DEET, a powerful chemical developed by the US Army for jungle warfare, which blinds a bug's senses. But it also comes with pretty serious health and environmental worries. Thankfully, there are other potent options these days. Sprays drip and rub off. So when you're exercising, playing sports or working outside, opt for a patch that supplies your blood stream with Vitamin B1 through the skin. It's then excreted through your pores. The vitamin-enriched sweat actually repels mosquitoes, flies and ticks. It lasts for 36 hours, but note that men should wear two to be fully effective. When you want DEET-level protection (but don't want to smell like you're wearing bug spray) use a product made with picaridin. 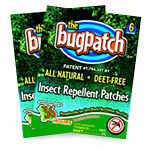 A scentless chemical, it doesn't damage fabrics or plastics and is less irritating to skin than DEET. This formula, with a picaridin concentration of 20% was introduced last year and offers eight hours of protection from mosquitoes, black flies and ticks. For a completely chemical-free solution, look for the only natural repellent approved by the Centers for Disease Control and Prevention: lemon eucalyptus oil. This pump spray has a cool herbal scent and isn't sticky or greasy. And while it keeps mosquitos, fleas and flies away for up to six hours, it is less effective against ticks, so it may not be ideal for those in tall, grassy areas or under heavy tree cover. Only female mosquitos bite humans and animals. Males typically feed on nectar and plant juices.